Home Uncategories The Tigers took Matt Manning in the MLB draft, but who is he? The Tigers took Matt Manning in the MLB draft, but who is he? For the first time in who-knows-how-long, the Tigers had a top-ten pick in the MLB amateur draft. That's the consolation prize after hitting rock bottom in 2015 and posting one of the worst win/loss records in all of baseball. It was a long, tiring, ugly season, and we've been waiting a long time to see if that number nine draft pick would make it all worth the pain and suffering. 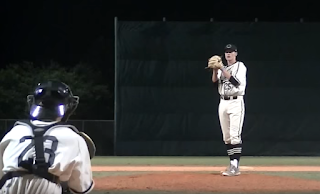 On Thursday evening, the Tigers selected Matt Manning, a hard-throwing right-handed high school pitcher as their draftee of choice. So ... was it worth it? I chatted with Brian Sakowski, a national scouting coordinator for Perfect Game USA, about who Matt Manning is and what he brings to the table. First off, who is Matt Manning? He's a big right-handed pitcher from Northern California, high school kid, he's massive and athletic and he throws hard, so, he kind of fits the mold of the Tigers' pick. But he's also a super-high upside guy, which really doesn't fit the mold of a Tigers' pick in recent years (except for maybe Derek Hill). When you saw Manning pitch, what were your impressions? Last fall I saw him at Perfect Game USA's big tournament event in October down in Florida, and he was the best pitcher there by far. And that was at 90-92 MPH with a below-average curveball. Best pitcher there. And now, here we are in May/June, this spring he was more 94-97 MPH with Rick Porcello-like sink at that velocity, with an above-average curveball. That's kind of what vaulted him into that #9 spot. So are we looking at Rick Porcello 2.0, a ground-ball pitcher who relies on contact, or are we looking at more of a high-strikeout pitcher? He's automatically going to have more swing-and-miss stuff than Porcello because he throws the ball six or seven MPH harder than Porcello does, with the same amount of sink. But at the same time, he's the type of guy who understands ... sometimes getting a significant amount of ground balls is a good thing, you don't have to miss every bat. In other words, Manning is an big upgrade over Porcello. He's more athletic than Porcello was, his curveball is better right now than Porcello's was at the same stage, the athleticism and the delivery allow us to project that he's going to have a good changeup. This isn't really a player comp to Porcello, this just gives Tigers fans an idea of what they might see here. I think his upside is higher than Porcello. Same kind of idea, though. A heavy sinker guy, a ground ball guy, but a guy who has the ability to miss bats when he wants to. What is Manning's projection as a future starting pitcher? Is he a future ace, a number two guy, a number three guy? In a perfect world he's a number two starter, but his realistic outcome is a number three starter type. Kind of like what we see with Michael Fulmer right now. If everything comes together perfectly, and he has good command, if the changeup is great, he's a number two starter in a perfect world. That's probably what Matt Manning is. He's probably not going to miss as many bats as Fulmer has the ability to, because Fulmer has an above-average (or better) slider, whereas Manning doesn't have that much spin, but the same kind of idea. Number two, number three starter. Is drafting Matt Manning a sign of change in philosophy in the Tigers organization? That's a really good question. I don't know. If they take a guy like Riley Pint, that's a complete 180 because it's all upside, there's no safety there. You know, they took Jonathon Crawford, and it's like ... ok, yeah, he's probably a reliever even if it doesn't work out. They've taken soft-tossing lefties like Tyler Alexander and Kevin Ziomek. You know, the Tigers have always been ... Dave Dombrowski had the approach with his scouts, find guys who are going to be quick through the minor leagues, not necessarily the highest upside, but quick through the minor leagues -- so I can trade them. That was the approach to the system. Find guys who are going to rake in A-ball, Low A-ball, and even Double A, so I can trade them. Get me the guy who's going to be in Double A next year, instead of, get me the guy who might be a star, but it's going to take five years. It remains to be seen whether drafting Matt Manning represents a change in organizational philosophy then. It also remains to be seen whether he will actually sign with the Tigers or whether he will choose to attend Loyola Marymount. Tigers beat writer Matthew Mowerey says the Tigers aren't too concerned about Manning's willingness to sign. If he does sign with Detroit, it likely won't be too long before he arrives in West Michigan and local Whitecaps fans will get a chance to see his talent first-hand.